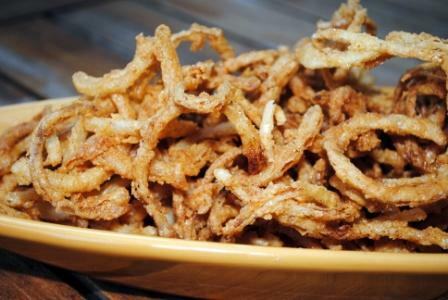 I have two words to say about these onion rings — thin and crispy! I have always loved onion rings but always hated biting into one and having the onion slice slither out of the breading, usually burning my lip because I was in a hurry to eat it. This will not happen with these onion rings. This was one of my parent’s recipes that my mother use to make. When my dad started taking over a lot of the cooking, he then did these to perfection also. He would even use this same method to make fried squash or even fried banana peppers. I really think you could use this on just about any vegetable. I’ve been wanting to try green beans and will do that the next time I get out my deep fryer. If you have never tried making onion rings because you think it would be too complicated, think again. 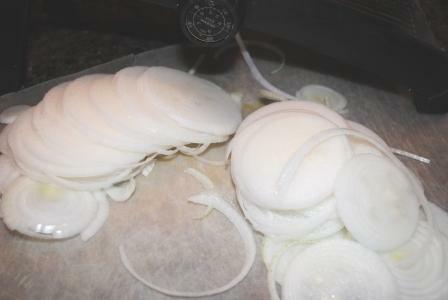 In this recipe you simply dunk the thinly sliced onions (I think having a mandoline is a must) into buttermilk. Let them set a few minutes and then shake in self rising flour. Definitely use self rising flour because the flour already has salt and baking powder in it and it just makes for a tastier coating . I’ve tried using plain flour but when I do, it seems like I can never get them salty enough after frying. Try these with your next BBQ burgers. That’s what we did when my daughter came for the weekend. Oh, and another thing. One onion goes a long way. I did one onion when I made these and it would have been enough to serve 4. 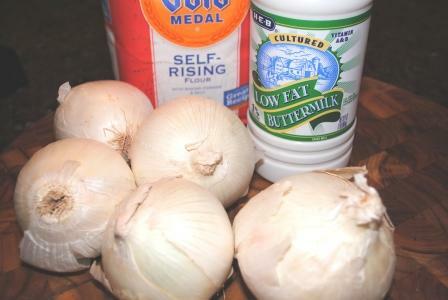 Onions, milk, flour and a dash or two of cayenne pepper. With a mandoline you can get these very thin and uniform. Whether it’s an expensive mandoline or a $10 one, you really need to have this item in your kitchen. All coated with the flour. I usually separate my flour into small batches so it doesn’t get all gunky by the time you are finished dipping your onion rings. Ok, I know that is a Christmas tray but that is one of my favorite trays to use in the kitchen. Your guest will not be able to keep their hands off these. Peel the onions. Using a mandoline or cut by hand into very thin slices. Cut the slices in half and separate. Put the onion rings in a bowl and pour the buttermilk over them. Either refrigerate until ready to fry or continue on with the recipe. Add the cayenne pepper to the flour. 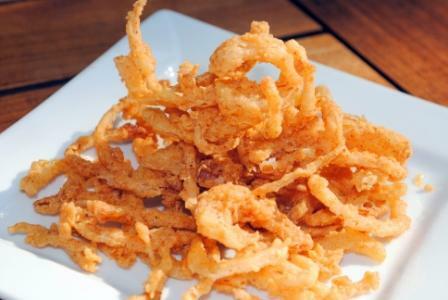 When ready to fry, take a handful of onions out of the buttermilk and put in the flour and shake around until coated When the oil is to 350-375° take a handful of the onion rings, shake a little to remove excess flour and drop in oil. Fry until nice and brown. Remove from oil and place either on paper towels to train or a cookie cooling rack set over a cookie sheet. I think once you have tried these, you will agree that they are fantastic. I did try them and they are delicious. My husband is not big on onion rings but LOVED these. Me too. Caroline, my parents use to make these all the time. My dad use to also use the same method to do some hot peppers or zucchini or yellow squash. I think you could try anything with this mixture. 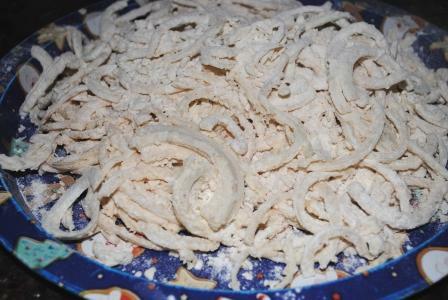 A tip for not getting too much flour burning in the bottom of the pan is to put the flour coated onion rings in a sieve and give a few shakes. That gets rid of some of the extra flour.